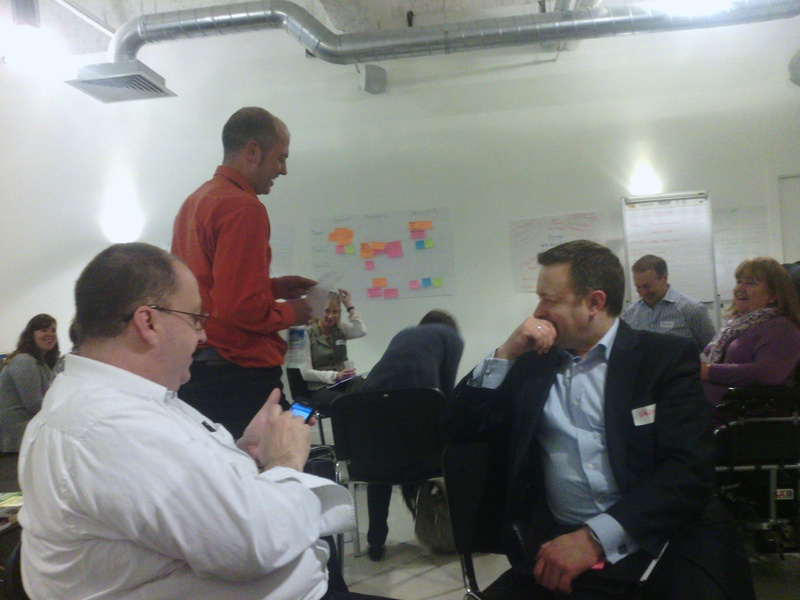 I had the pleasure of attending my first unconference on the 24th April, the event was the The LnD Connect Unconference and a totally new experience for me. A new experience that I was really looking forward to given the outputs I saw from the L&D Capability in Australia Unconference . Looking back I can’t believe we covered so much, I took some notes using my trusted Asus Transformer and want to share some of the conversations we had from the World Cafe Session which was the first session and really set a positive tone for the rest of the day. What should L&D stop doing? What’s happening in L&D that excites you? What’s happening tomorrow / in the future for L&D? To take the opportunity to show that using tools, technology, any form of communication & collaboration is all LEARNING !!!! So as you can see we covered quite a lot in about 45 minutes! One thing I took away from a personal perspective was that my taking notes didn’t impact the groups in anyway or have an adverse affect on my ability to contribute. It’s been great to capture these conversations and to be able to reflect on them following the event so I’ll look to do this again in the future. > Would you challenge or question any of the things that you can see here? > Can you add to them and/or develop them further? I’d like to thank the organisers of the LnD Connect Conference for putting on a fantastic event and if you are interested in finding out more then follow the hashtag #ldcu and follow @LnDConnect to join in the conversations. Finally @MartinCouzins (seen below in the red shirt) has curated all the posts and resources from the event which you can find here including a great Storify from @KingFisherCoach and a great video summarising the event filmed by Martin himself. This entry was posted in Learning Conversations and tagged excitement, future, L&D professionals, LnD Connect, stop doing, unconference by thelearningasylum. Bookmark the permalink. Nice report Mike, the list of some of the current woes besetting L&D and then the hope and future possibilities provides a bit of a blueprint for us to move on in our drive to inrease our impact, create our longevity as a profession and ultimately be involved in all things around individual and collective brilliance. (a) Those in the know already get this and were probably in that room party because they get it, so how do we get the “others” into this and helping make it happen? (b) How do we all come together to get the business and academia world to recognise what “nu” L&D is all about and teach it, endorse it, let it flourish by supporting it? Maybe we need a proper movement? Maybe we already have one? I sense we’re all doing our thing and it SEEMS to be coming together but will it be soon enough? Powerful enough? Will it bring the L&D profession into the 2020 model we passionately believe it needs to be? (a) We must demonstrate the value of doing things differently at every opportunity, we need to amplify these sorts of events and the content from them using as many different tools as possible and go back in to our respective businesses (or if you are the business) then change & challenge how things are done. Sometimes we just need to do it and stop talking about it. (b) For me it’s about connections, the more people we can get to attend events like LnD Connect or similar events where L&D peeps can get together from different backgrounds, industries and with different perspectives and experiences the more we can share ideas and develop out thinking as a profession. “I’m in this game to create a better future, and have a ball doing it.” – LOVE THIS! I hope we’ll get the opportunity to work together to do this…..
Mike – great looking site and first article. The points you list could be exactly what we are going through at the moment, but as Perry said, when we have these discussions, we’re preaching to the converted. I like the point about ‘stop being driven by vendors and trends’. The learning itself doesn’t change, just our delivery of it. Don’t know when the last time we went to the business and asked them what they want, rather than said – here is what you need!! Look forward to reading more of your thoughts! Thanks for stopping by Damian and for the feedback, really appreciated. Hi Mike – great to see you have taken the plunge and started your own blog, hopefully that might motivate me to dust mine off more regularly. It sounds like the unconference was a great experience, I’m a bit gutted I didn’t make the effort myself. It needs leadership, but what that means in this context is hard to say. There are plenty of “thought leaders” in our industry, perhaps too many and yet they haven’t managed to effect the changes we want to see. So it’s more about personal leadership, spreading the word, walking the walk and showing what can be done. But as you and I both know that’s a long and hard road to tread in some organisations. However, things do change when leaders care about them. I’m witnessing some really exciting developments where I work at the moment. I’d like to think it’s because of my persistent efforts and strong influencing skills that people have come round to my way of thinking. In reality it’s because the most senior people recognised the importance of changing our culture to progress as an organisation. Hi Sam, thanks for your comment and I couldn’t agree with you more around leadership. Your thoughts have given me an idea for another blog so if I do this one then you’ve got to blow the dust off yours and let us know about the exciting things you’re doing AND just how persistent you’ve been. Deal? Ok you’re on. One last thing I meant to add earlier.. maybe this is the point we stop hiding in our little silos; elearning, coaching, OD, talent management, performance management etc. All the progressive people in these areas have spent too long playing with themselves (so to speak), instead of joining forces. I know elearning is guilty of looking down on the other parts of hr and complaining that we don’t belong there, when in reality we need to embrace it to help drive the changes that need to happen. Great responses Mike – especially from those who weren’t at LnDConnect – really spreading the word! Interestingly, although we said it wasn’t necessary for people to capture outputs from their discussions – some did and your summary is very comprehensive! It’s really useful to see and has re-confirmed my interest (as a bit of an old hand, potentially ‘old-school’ even?) in helping the L&D profession evolve into something new and exciting! It really feels like we are on the edge of the next phase – maybe the next unconference will tip us over … I quite like the theme of L&D in 2020 – What will it look like? Thanks for posting this Mike and I look forward to your other notes and reflections from the day. Thanks for your comment and I didn’t come with the intention to take (or type) notes, it kind of just happened. To be honest I think the actual event and people who attended helped here due to the fact it felt natural, people didn’t look at me and think I was being ignorant and I felt it actually helped me to contribute. I really feel that by taking notes & photos in some of the sessions we’ve been able to capture the essence of the event and continue the conversations with a wider audience.